Despite the fact that the Zune was only #18 on Amazon's sales chart (it's #17 now)—behind 12 varieties of iPods—Microsoft's doing quite well this holiday season. 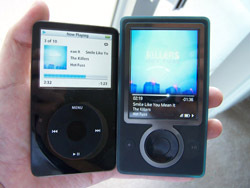 Statistics released by NPD Group says that while the iPod is still number one, the Zune's leapfrogged everyone else and claimed 9% of sales and 13% of total dollar share. Impressive, until you compare it to the iPod's 63% of sales and 72.5% of dollar share. Looks like Microsoft's 100 million dollar marketing spree is taking hold, at least enough for the Zune to beat everyone else except the iPod. Still, it wasn't enough to let us find a Zune buddy at the airport.